The products we offer at ALCOLOCK are the best you’ll find in the industry. How do we know? Because we control the entire process and develop our own products. That way, we can control the quality from inception to production. We’ve never been satisfied with offering a single device or reselling an existing line of products. Instead, we’re wholly committed to immersing ourselves in the industry. We’re proud to have established a reputation for being experts in our field. We’ve stayed at the top of the industry by developing a wide range of high-quality products that span the entire gamut, from lab equipment to devices that aid program facilitators to the breathalyzers and products the consumer uses throughout their program. The DRIVESAFE evoc is one of the quality products we offer to help make the road to license reinstatement and independence as easy as possible. The DRIVESAFE evoc is a smartphone breathalyzer designed to work with today’s modern driver. While most of our smartphone devices only work with Android phones, the DRIVESAFE evoc was designed with Apple IOS in mind. It’s a compact, portable device that communicates with both IOS and Android devices via Bluetooth connectivity. You can test quickly and easily, right from your smartphone, and share your results via SMS, Facebook, and Twitter. 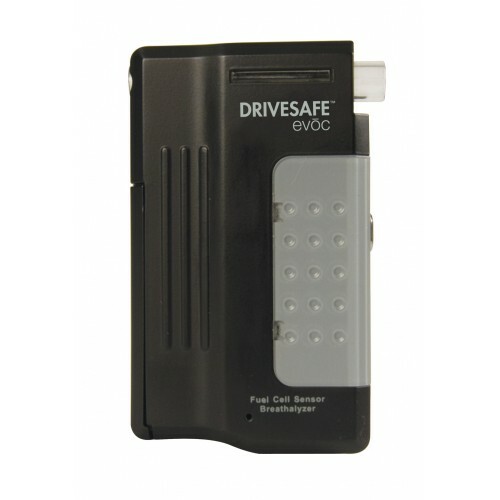 Each DRIVESAFE evoc comes with one AAA battery, five mouthpieces, and a carry case. Our customers love the versatility and compact nature of the DRIVESAFE evoc. Of course, they also love being able to use the device with both Android and Apple smartphones, but that’s not all. Here are some of the best-loved features of the DRIVESAFE evoc. ALCOLOCK’s DRIVESAFE evoc is just one of the wide range of products and services we offer. Whether you’re a driver looking for ways to successfully complete your program or a facilitator seeking to add to your existing line of offerings to better serve your client base, we have many options that can help you reach your goals. Check out our shop for more best-in-class products and services developed specifically to help you succeed. Compatible with IOS and Android smartphones. Wireless Bluetooth connectivity for compatibility and convenience. Industry trusted electrochemical sensor provides you with accurate test results every time. Conveniently stores previous test results. Share your results via SMS, Twitter or Facebook.